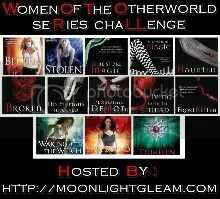 Some of my blog readers have read Kelley Armstrong’s WOMEN OF THE OTHERWORLD series, while other have not. For those who would like to (either read or re-read) these wonderfully fun paranormal romances, there’s a challenge being hosted over at Moonlight Gleam’s Bookshelf. Looks like fun to me! Basically, the goal is to read one book from the series every month. The schedule of what book is what month is up on the hosting site (see link above) so if you miss a month you can join in at any time. Then review or otherwise comment about the book on your blog or Goodreads, and link back to that review. There are prizes, too, but for me a large part of the fun will be just enjoying the books all over again. I’ve read all of the Women of the Otherworld books out so far with the exception of the newest, Spellbound. And then there’s the conclusion to the series, Thirteen, which will be out later this year. I look forward to getting to know my some of favorite fictional characters all over again with this challenge. Let me know in the comments if you decide to join me!